Our shark features sparkling glitter and premium merino wool felt. ONE beautiful hair clip set on an right sided alligator clip with a non-slip grip — made to fit comfortably yet securely. NOTE: If you would like a left sided alligator clip, leave us a note at check out. ★ VISIT US ON INSTAGRAM @bowfield_studio to see new items coming to the shop and a whole lot of cuteness! 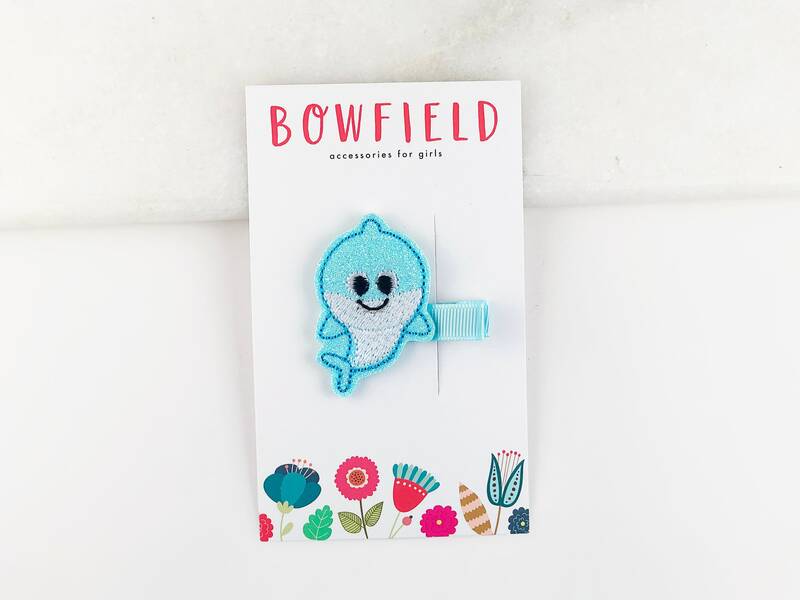 We also LOVE seeing your little ones in their new bows, so tag us or use the hashtag #mybowfield. Do not leave on children unsupervised while wearing the accessories! We hand make each one with great care, but they do contain small parts which could pose a choking hazard to young children.